Shadows of Brimstone is, for those who do not know, a miniatures-heavy Mine exploration (=Dungeon Crawler) board game set in the old Weird West, with slashes of Cthuloid horror tentacles and sci-fi time travelling mixed in by entering portals to Otherworlds found down in said mines. The original kickstarter blew completely up resulting in a sheer variation of miniatures and settings available for this game that is absolutely staggering! I am not sure I would be able lift it all at once even if it was packed up in the original boxes and strapped together! Anyway, I received the last wave of the massive Shadows of Brimstone minecart pledge a couple months ago, and have built most of the miniatures ready for painting since then. So the time has come to start. Much has been said about the quality (rather, the lack of…) the miniatures which are made in HIPS polystyrene much the same as Warhammer minis are. However, the quality of the details have definately improved, and these newer ones are significantly better than the minis in the first wave. Still far from GW- or Malifaux level though. But it really is a lot to expect for them to be on the level of market leaders with decades of experience. That aside, I really enjoy both building and painting the SoB minis immensely. This probably has something to do with the miniatures not being overly detailed and therefore delightfully unbusy. Whatever you might think of the quality as miniatures, as playing pieces they do have good and distinct silhouettes for gaming, you know what you are looking at at glance even when down on the table. We start with the Werewolf Feral Kin. 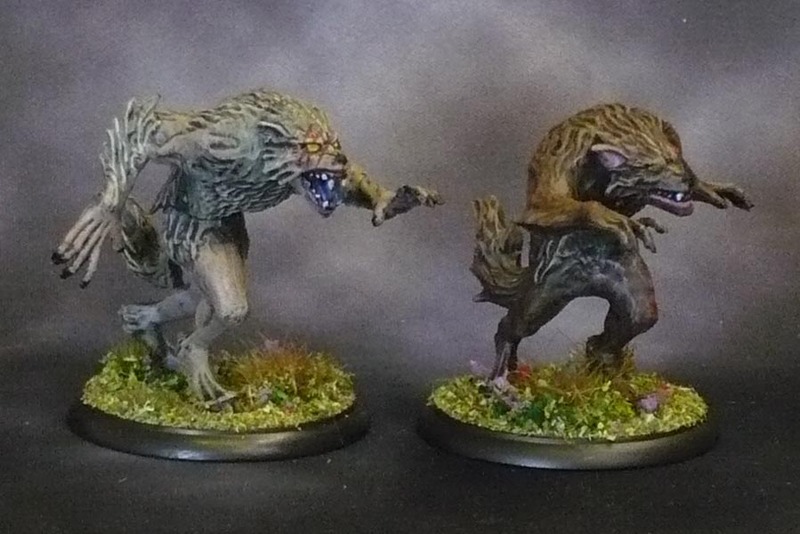 Six large-based miniatures in two different poses. For the game, these come in a “mission pack” which is a themed expansion with a set of enemies, some matching map tiles and assorted cards. These can be plugged in at almost any point in game by shuffling the cards into the exploration deck, and subsequently drawing the card in game where you discover the Feral Kin’s lair. Quite simple to paint, just a heavy drybrushed basecoat over black, with variant colours drybrushed over this. Details such as claws on hands and feet, eye sockets and mouths are done in black. I used Reaper Splintered Bone (offwhite) for the teeth and base coat-dots for eyes to prepare for the yellow I later put in there. (or else the yellow will be much darker and less visible). Blues for tongues, pinkish purple in the ears and lower lips, highlighted with a bit of cadian fleshtone. To add some interest and to tie them all together as a unit I painted three red stripes over one of the eyes on each of them. 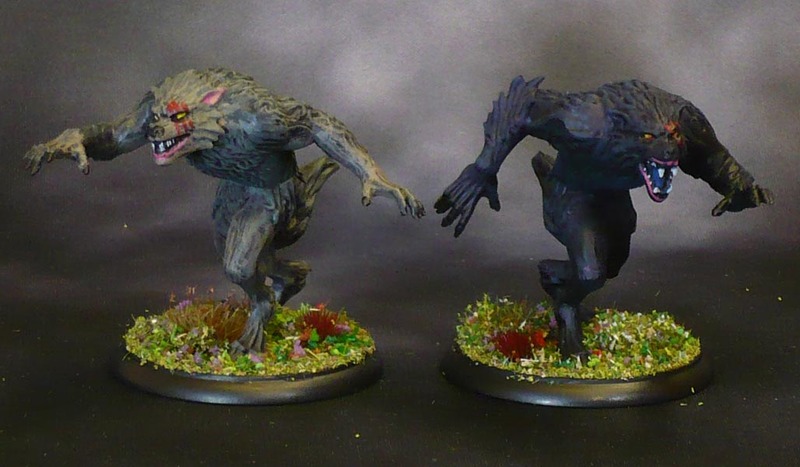 These are also good as more Werewolves for my Kings of War Undead Army. I think I should have enough now to field an all-werewolf army, at least for smaller games. Based with tufts and magic flock mix and done. These took about an hour or so to do. Nice work on these – the paint is pretty nice and I like the use of different colours to differentiate them,. I got as far as assembling them, before losing them somewhere. I’ll find them eventually. 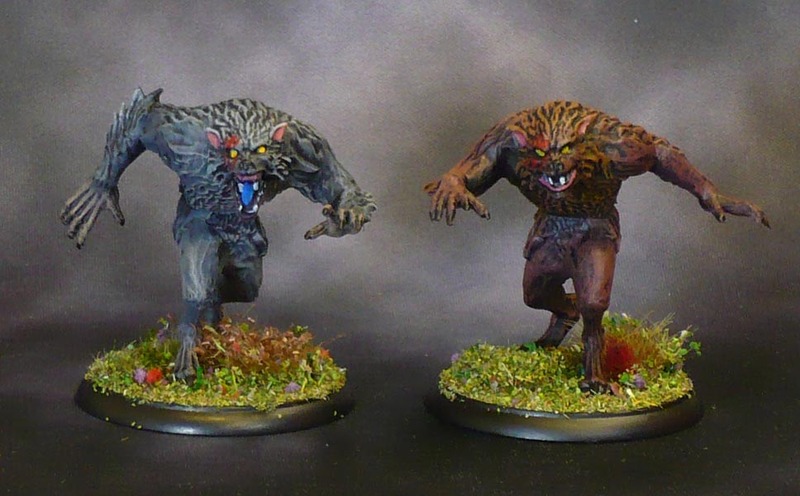 They look good, and it’s nice to see decent werewolf miniatures painted up.